When you’d like an alternative to Southwestern and Native American art, please consider visiting a gallery that specializes in a broad spectrum of contemporary art in many different media. Palette Contemporary Art and Craft, located in the Mossman Center between Louisiana and Pennsylvania at 7400 Montgomery Blvd. NE, is such a place! Palette searches locally, nationally, and abroad to assemble contemporary art and craft with a colorful edge and clean look. Areas of special interest include our collection of international fine art glass, abstract and contemporary paintings, limited edition signed prints, jewelry, marbles, and mid-century modern radios, clocks, and watches. All by both emerging and renowned artists. If you love modern art, in all of its forms, then Palette is for you! A great time to visit us is during one of our many receptions and exhibition events, which can be found on our Events page. We are willing to hold professional association receptions at palette as well. Please let us know how we can meet your reception planning needs. 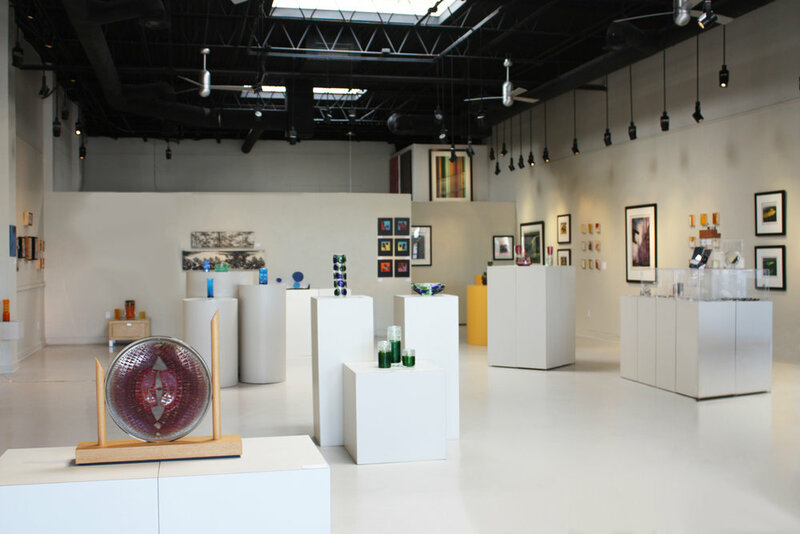 Palette contemporary art and craft is sure to provide you with a unique Albuquerque gallery experience as well as offer pieces you will want to acquire to enhance your home or office environments. Call us, email us, or stop in to see us. We look forward to meeting you!